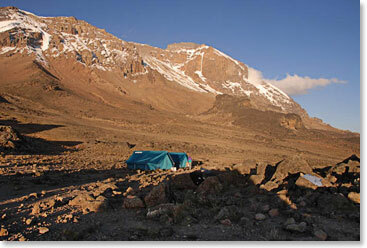 Hello, this is Bob Birkby calling from Karanga Camp at 13,900ft/4236m. We are resting happily in camp after a long and challenging day…Transmission lost. Unfortunately, I was unable to interpret Bob’s dispatch due to a poor satellite phone connection. However, I spoke to Wally and he gave me an update on the day. Today is one of the longest on the mountain with plenty of altitude gain and loss. You may notice that Karanga Camp where the team is sleeping tonight is 1,100ft/335m lower than last night’s Lava Tower Camp – don’t let that deceive you, the team did a lot of climbing today too! 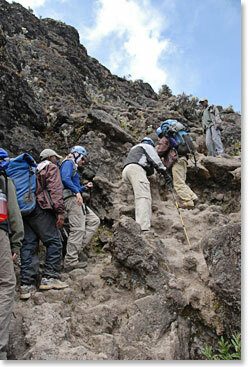 After a delicious hot breakfast at Lava Tower Camp, the team set out through the Barranco Valley. Around noon they arrived at the infamous Barranco Wall – a very steep 800ft/244m wall that involves steep switch backs and some fun scrambling. Everyone made it to the top of the wall exhausted, but exhilarated. They continued on up the Karanga Valley to Karanga Camp after a long 9 hours of hiking and climbing. Well done team. Tomorrow they will continue up the mountain to Kossovo Camp – over half way there!